There are two primary reasons why you need to winterize your pool. First, is to keep your pool water clean until next season so you can conserve water and chemicals. The second and most important reason is to prevent the pool water from freezing and damaging your entire pool system - from the physical structure to its pumps. Winterizing a pool is a long and tedious process. The most important winterizing accessory you will need is a winter pool cover. Pool cover installation is the last step of the winterizing process. After you have removed all your pool accessories, cleaned your pool, and ensured that it is chemically-balanced, your pool cover will keep this state intact. You cannot settle with just any other pool cover. It needs to have high break strength and should be resistant to the sun’s rays which greatly affects pool chemicals. To make the selection process easy for you, we have gathered the best winter pool covers from Arctic Armor. We will share the best features with you, and why you need to get it for your pool. Perfect for uneven pool shapes, the Arctic Armor Ultra Light is uniquely designed to provide protection to the different shapes pools, not just the rectangular ones. It can be installed in an irregular pattern to completely cover every curve or bend of your pool. The fabric is made with lightweight, dual-layer polypropylene mesh that enables easy installation and removal. You will never have to worry about installing it on your own. The possibility that the pool cover might be too heavy, risking it getting submerged in the pool during installation is less likely. 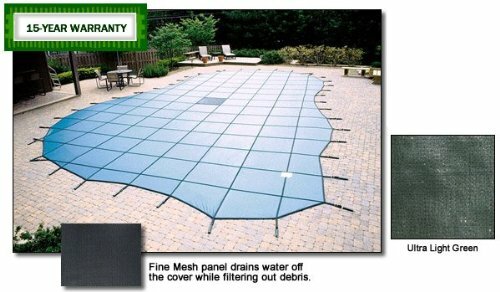 The pool cover has a center mesh that filters leaves, dirt, and debris keeping your pool clean throughout the season. Some pool owners still find the need to install a leaf net on top of the winter pool cover for easy cleanup. The center mesh also prevents water build up - something usually remedied by using a water pump to siphon off water to avoid weighing down the pool cover. The Arctic Armor Ultra Light has a 5 feet x 5 feet webbing for added strength. This reinforces the whole pool cover as each of the webbing’s ends are connected to the brass anchors installed on the pool perimeter. The pool cover material is solid and impenetrable to UV rays, mold, and mildew. It will keep your pool free from algae during the downtimes. That means you can expect sparkling, crystal clear pool water at the end of the season. Arctic Armor Winter Pool Covers have a 2 feet allowance on the sides and top to fit your pool perfectly. It comes as a set together with the installation materials such as brass anchors, stainless steel springs, installation tool, storage bag and complete installation instructions. It is available in standard colors Blue and Green, while you can have it customized in Gray or Tan. Arctic Armor offers a 20-year warranty for its Ultra Light line. ​Break-strength of up to 4000 lbs. It is nice to find a pool cover that considers the shape and aesthetics of pools. Not all pools are rectangular, and the shape of a pool cover helps maintain its stability. This prolongs the life of the pool cover without stretching it too much or trying to make it fit. The mesh center of this pool cover also fills in for a leaf net and you will no longer need a water pump to remove water build-up. During the downtime period after the chemical preparation and before the installation of the pool cover, the pool’s filter is turned off and will remain off until spring. The pool’s stagnant water during winterization makes a perfect breeding ground for algae. 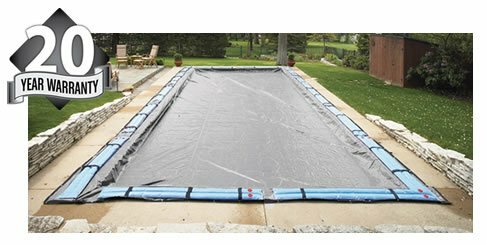 Arctic Armor Gorilla Pool covers address this concern with its triple-layer woven polyethylene material. This is reinforced by a UV-retardant black underside lining. All sides of the Arctic Armor Gorilla are secured in place by the water tubes. These accessories are like swimmer floaters but you need to fill it with water instead of air so it will add weight to all sides of the pool cover. The pool cover has built-in loops every four (4) feet to secure the water tubes in place. Water tubes are sold separately. Arctic Armor Gorilla pool covers have a 5-foot standard overlap across all of its sizes. This will ensure proper placement of the water tubes. This will also provide better stability and less strain on the pool cover material. It also gives enough allowance in case of water build-up in the middle of the pool cover. Tight placement of all corners of your pool cover is made possible by rip-proof metal grommets on all corners. Gorilla pool covers are covered by Arctic Armor’s 20-year warranty with a 3-year full guarantee. The Arctic Armor Gorilla line is suitable for those who do not want a complicated installation process for their pool covers. The material is thick and heavy duty and will surely last for a very long time. Water tubes are proven great at keeping pool covers stable however since these accessories do not come in the standard package, it might not complement the pool cover. This is an area for improvement that the brand should consider.